ABLUTION CUP - HT.5-1/2" - 12 OZ. ABLUTION CUP/ASH HOLDER - 3-1/2" HT. 3 OZ CAP. 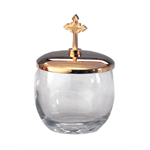 ABLUTION CUP/ASH HOLDER - 4-1/2" HT. 5 OZ CAP. ASH HOLDER - 4-1/2" HT. ABLUTION CUP/ASH HOLDER - 3-3/8" HT. 3 OZ CAP.